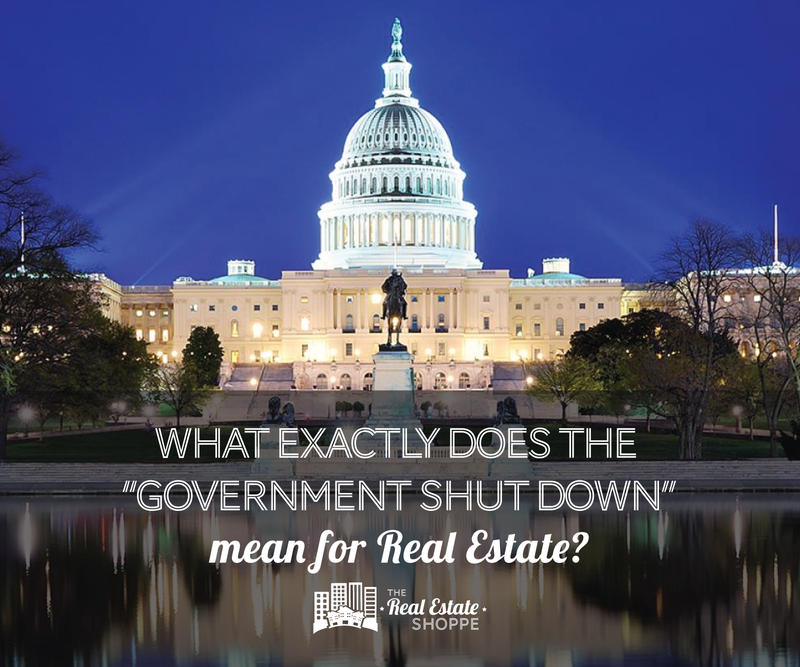 What does the Government Shutdown mean for Real Estate? Since midnight December 21, the nation has been facing numerous effects of a "Government Shutdown", with lots of uncertainty about when operations will return to normal. We've received lots of questions about how these challenges would influence Real Estate and timely closings - specifically on FHA loans. Under EPA's shutdown plan (link is external), most employees are now furloughed. This will affect various regulatory programs and compliance activities, such as wetlands determinations under the 404 program and enforcement of the lead-based paint disclosure and renovation, repair and painting programs. HUD’s Contingency Plan states that FHA will endorse new loans in the Single Family Mortgage Loan Program except for HECM loans. It will not make new commitments in the Multi-family Program during the shutdown. FHA will maintain operational activities including paying claims and collecting premiums. FHA Contractors managing the REO/HUD Homes portfolio can continue to operate. Some delays with FHA processing may occur due to short staffing. Fannie & Freddie are operating. During previous shutdowns, Fannie Mae and Freddie Mac have continued normal operations since they are not reliant on appropriated funds. On December 26th both GSEs updated or clarified their loan purchase requirements in case of a shutdown. Freddie Mac requires all borrowers to sign a 4506T request form prior to close, but the request does not have to be processed prior to close. Fannie Mae requires the same unless the borrower’s income can be verified though Fannie Mae’s proprietary Desktop Underwriter verification system in which case no 4506T is required. The IRS will close and suspend the processing of all forms, including requests for tax return transcripts (Form 4506T). While FHA and VA do not require these transcripts, they are required by many lenders for many kinds of loans, including FHA and VA. Delays can be expected if the shutdown continues. Some loan originators may adopt revised policies during the shutdown, such as allowing for processing and closings with income verification to follow, as long as the borrower has signed a Form 4506T requesting IRS tax transcripts. Flood Insurance is not affected! "After NFIP operations were initially suspended over questions raised by government attorneys, NAR worked with the White House and Congress to clarify that the government shutdown does not affect the sale or renewal of flood insurance policies or the payment of claims on existing policies. Disaster relief, airport screenings and other essential homeland security functions are unaffected." The U.S. Department of Agriculture will not issue new rural housing Direct Loans or Guaranteed Loans. Scheduled closings of Direct Loans will not occur. Scheduled closings of Guaranteed Loans without the guarantee previously issued will be closed at the lender’s own risk. Until the shutdown ends and the Regional Center EB-5 program extension is signed into law, the EB-5 Immigrant Investor Regional Center Program is suspended and no new I-526 petitions can be filed. Investors must continue to file timely responses to USCIS Requests for Evidence (RFE) and Notices of Intent to Deny (NOID). In addition, investors may continue to prepare and file I-829 petitions. While the Department of Labor was funded for 2019, the Department of Homeland Security was not. Therefore, while the H-2B Temporary Worker Visa program is still operational for workers currently in the U.S., the DHS is unable to approve any new or returning workers under an H-2B visa. Last updated April 19 at 2:10 am.